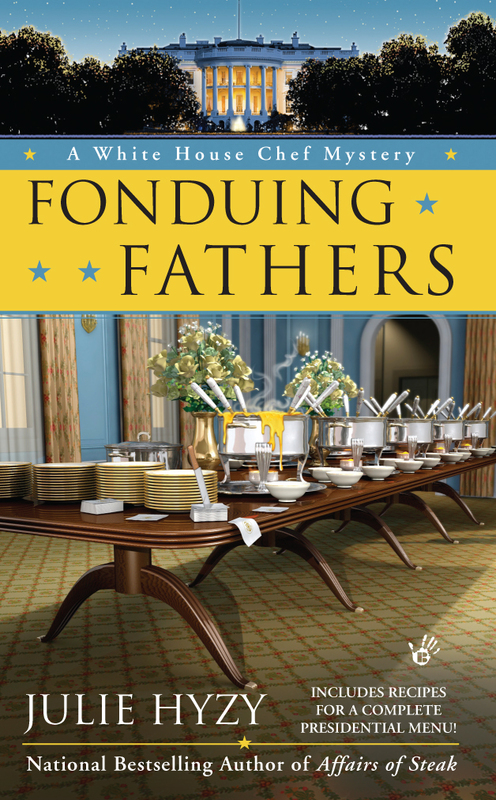 So far, only a couple of people have actually said it, but I'm going to bet that when FONDUING FATHERS hits the shelves in bookstores around the country on December 31st, more than a few people will be scratching their heads and wondering if I'd meant "Founding Fathers." 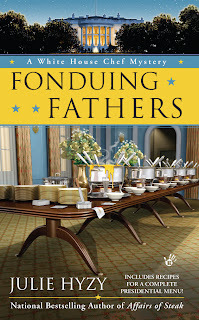 My White House Chef mysteries usually come out with fun, punny titles. I love a good pun and when I can't come up with one, my publisher does. In this particular case, a friend jumped in to suggest the title. I loved it and I was thrilled to find out that Penguin/Berkley Prime Crime did too! There is a little bit of fonduing in Ollie's world this time. But far more about fathers. Ollie embarks on a quest to find out what really happened to her dad -- it's a subject her mother has been reluctant to talk about for Ollie's entire life. I don't want to give too much away, but I will tell you that if you've read the series thus far, I think you'll enjoy this installment. Right now, it's my favorite of the series. This cover has a yellow banner, which is surprising considering that the one before it, AFFAIRS OF STEAK, had a gold banner. And the font is ever so slightly different on this book. No idea why. But Penguin/Berkley has always done such a wonderful job with my covers that I see no reason to point these tiny changes out. They must be there for a reason. So what do you think about the cover? Thumbs up or down? Thumbs up, of course! Looking forward to the latest installment of Ollie and Co. 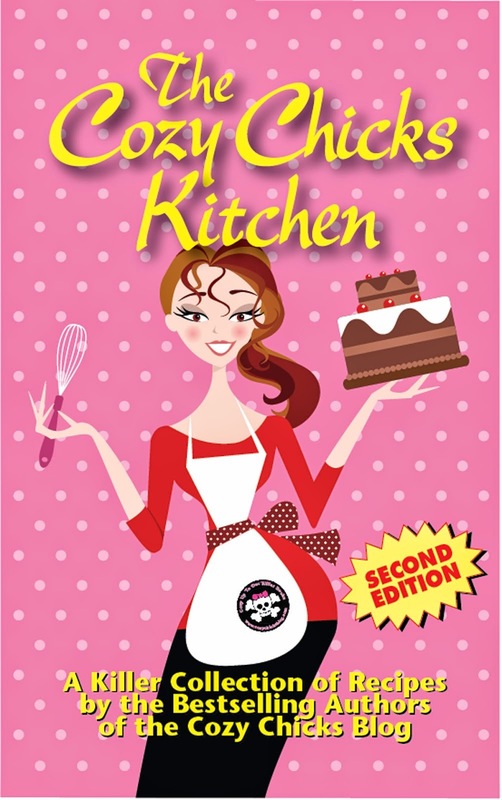 I like it :) and most cozies have a fun title that you sometimes have to read twice to understand the joke. 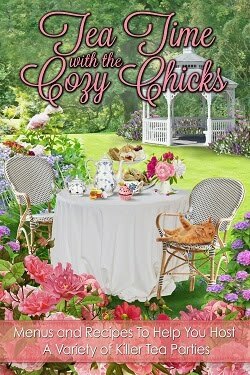 Cozy mystery covers and titles are always fun I think. I like this one, it grabs your attention. I can't wait to read it! Thumbs up! Love the cover. It looks awesome, and the title is fun! Love the cover especially because I love the table. That's a dining table hubby and dream about buying. Any mystery which includes recipes catches my eye. I read your first one and liked it a lot. Does it help if I ask my library to buy your book? Yay, Adrienne! First comment! Thanks for the vote of confidence! Great info about your daughter and asst. chef at the WH, Sam Kass, btw. So cool!!! Aurian - isn't that the truth! Glad you got it! Thanks Jeannie D.! - I'm so glad you think so! Debra - absolutely it helps!! Libraries are wonderful! They order our books and best of all, they don't return! LOL I love the table, too. Hope you get your dining table soon! I love your covers and look forward to reading this installment in the life of Ollie. I'm between books now, so wish we could all read it NOW!!! 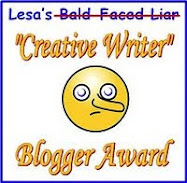 I have always liked your covers and titles! I prefer something that makes you try and figure out what the book will be about before you even start to read! Thank you for having such a wonderful talent in writing and letting us come along and enjoy them! Definitiely thumbs up! Titillating and makes me anxious to read now!